THEN: Looking northwest across a bench in the rise of First Hill, ca. 1887-88. The photographer was probably one of three. George Moore, David Judkins and Theodore Peiser were the local professionals then most likely to leave their studios and portrait work to take this shot from near the corner of Seventh Avenue and Jefferson Street. NOW: Jean Sherrard's repeat looks from the western border of Harborview Medical Center's campus near what was once the steep intersection of Seventh and Jefferson. Long ago when first I studied this look northwest across First Hill I was startled by its revelations of the hill’s topography. The hill does not, or did not, as we imagine steadily climb from the waterfront to the east. For instance, here Cherry Street between Fifth and Sixth avenues — the white picket fence that runs across the scene’s center marks the north side of that block — keeps a fairly flat grade and then, where it intersects with Sixth Avenue, defies all our modern expectations and dips to the east. 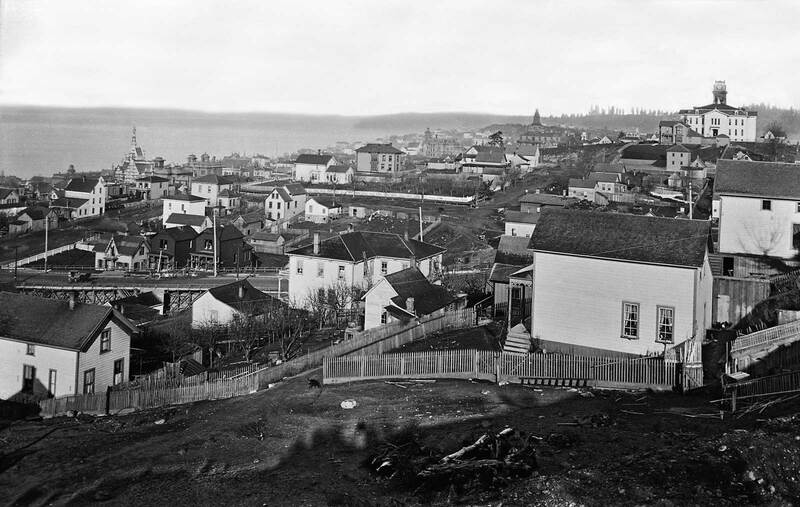 James Street, on the left, climbs First Hill between Fifth and Sixth on an exposed-timber trestle. To the lower (north) side of that bridge there was about a four-block pause between James and Columbia, Fifth and Seventh, in the steady climbing we expect of First Hill. 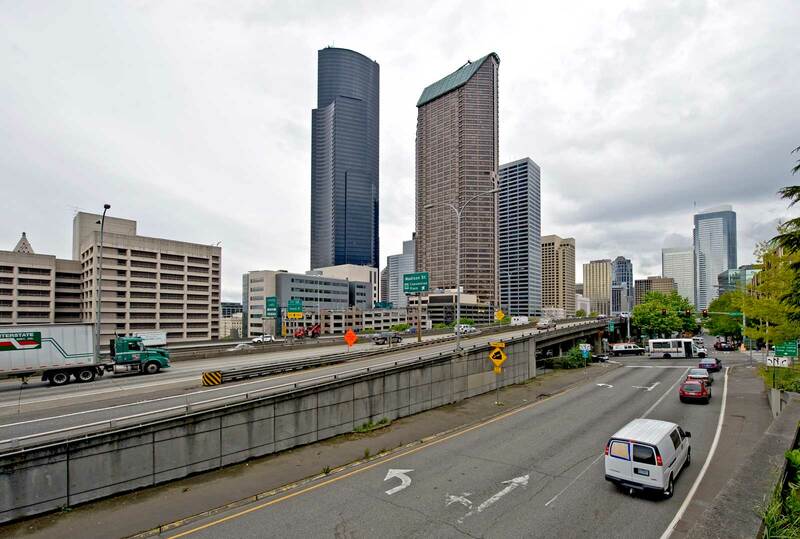 Now in these blocks the flat Seattle Freeway repeats this feature ironically. There are enough clues here to pull an approximate date for this unsigned cityscape, which looks northwest from near Seventh Avenue and Jefferson Street. It is most likely sometime during the winter of 1887-88. The best clue is the Gothic spire atop the Methodist Episcopal Church (until recently First United Methodist) far left of center. There is still construction scaffolding on the sanctuary, which was completed at the corner of Marion and Third Avenue in 1889. On the far right horizon is the Central School (it burned down in 1888) and to this side of it the McNaught big home, recently featured in this column, at its original grade on the corner of Marion and Sixth. This panorama is strewed with other pioneer landmarks, including the Western House at the southeast corner of Sixth and James. It is the large L-shaped box below the scene’s center. Anything to add, Paul? – And don’t forget that we’ve got an appointment this afternoon in West Seattle. At 1:30, we’ll be taking a photo of a crowd in front of the Homestead Restaurant, as mentioned in last week’s column. Paul replies: I’ll begin by adding my voice to your voice, Jean. Yes I’ll be at Alki Point to be photographed by you, because, you know I riding over there with you. And I do have something to add as well to the above story. This is easy. May the reader go back to May 1 of this year (nine pages back) and find the now-then feature about the McNaught mansion at 6th and Marion. It includes other images that relate to this week’s point about the odd topographic ways of First Hill in its ascension from 5th to 8th through a section holding (or whatever) Jefferson through Marion Streets. One of the pictures supporting that story is the same one that was used for the primary photograph this week. So the reader gets two captions for one. On the side and also in closing, I will say I am most startled by finding that “back then” when the flowers of May were asked to wait a while longer by the showers of April, we had only reached Our Daily Sykes #18, and here we are into the seventies. Horace would be proud of us Jean. Previous PostOur Daily Sykes #75 – Wallowa LakeNext Post"This Place Matters"